Keeping your home looking immaculate can be a great source of pride and joy for you as a homeowner. You may love that you are able to personalize the home and make it as beautiful as possible for yourself and neighbors. One aspect of your home that can have the biggest effect on its appearance is your siding. Aged siding can make your entire home seem shabby and worn if not replaced. 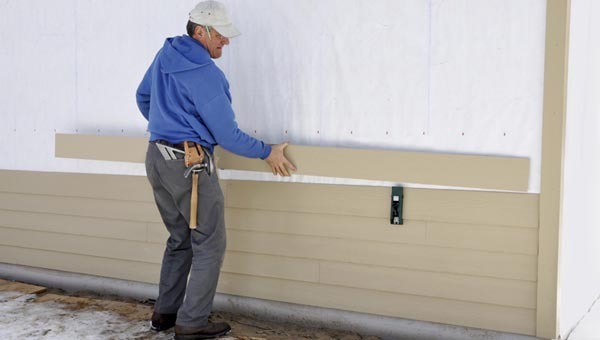 Included here are a few signs that it may be time for you to replace your siding. Siding that is in good condition should hold high quality paint properly for 15-20 years and a minimum of 8-10. However, if your siding is aging and in poor condition, you will feel the need to repaint every 5-6 years when it begins to look shabby again. Paint that is chipping, peeling and cracking is an indication that there is a bigger fundamental problem with the siding. Your siding provides a great deal of the insulation to your home and can keep your energy bills low. When your heating and cooling bills begin to skyrocket, it may be a sign that your home is not well insulated. While your roof and windows could be the sources of the problem, your siding should definitely be considered. If you notice problems with the siding you should also ensure that the insulation is high quality as well when replacing. Doing a visual inspection of your home’s siding can be a good indicator of its quality. Keep an eye out for any boards that appear to be warped by holding a straight object against the building’s side. Any rotted boards will be visually apparent, and you should poke underneath to find the source of the rot. If there is a water leak from within the home or just a poor seal on the exterior. Siding that is beginning to crack has become too weathered to do its job suitably. Any siding that appears to have cracks running vertically or horizontally along the shingles should be replaced. Also, if you see siding that appears to have loosened, moved or begun to fall off, you should replace immediately. Anytime you see evidence of water damage within your home, it is cause for alarm. While it could mean you have a burst pipe or water line, it also could mean your external watershield is not working. You could have roof or siding damage and it could have dangerous ramifications for the home. If you see damaged paint or wallpaper inside of your home, be sure to find its cause as quickly as possible.